For all the worrying us parents do about whether or not our children know we love them, we often overlook the most basic way to show children they are loved. It is not in the amount of money we spend or even in the general amount of time. “Girls!! We have to leave!” I yelled up the stairs to Hannah and Hazel, who were all too far down the rabbit hole of princesses and baby dolls to register any words coming from my mouth. I had been busy for the past hour…you know…being busy. Like us moms are. I unpacked the dishwasher. Folded a load of clothes. Started up a new load of clothes. Cleaned up from lunch. Let the dog out. Fed the cat. Packed up book bags. Folded a blanket here, turned off a tv there. Just being busy…because that’s what a mom’s life is. Fits and starts of busy that come in bursts so frequent that it seems nonstop. And not that it’s bad. Life as a “busy” mom is good. I feel lucky to be able to stay home but in doing so I have found a pretty well defined need to “prove” my worth as a mom by rarely sitting down and always finding something else to be “busy” with. But all the while…my 2 girls had been upstairs intricately imagining a world of princesses and fairies and pixie dust. They were tending to no less than 9 babies, most of which were battling some sort of ailment and needed IMMEDIATE attention at their check up in the adjoining room. They were playing dress up and restaurant. They were being moms and doctors and vets. And during this time I would intermittently hear an attempt by one of my kids for me to join them. And about a dozen more of these requests…each one a little quieter than the other. Each one asked with a little less enthusiasm. Because even a child knows when you don’t have time for them. I’d like to say I recognized my mistake in the midst of all of this but it honestly didn’t hit me until much later that evening. In those sacred hours between their bedtime and mine. When my thoughts can be MY thoughts and I may even sneak in to pee without an audience. It was then…in that quiet time…that I realized I was failing to show my kids in the most basic of ways that I loved them and cared about what they were doing. 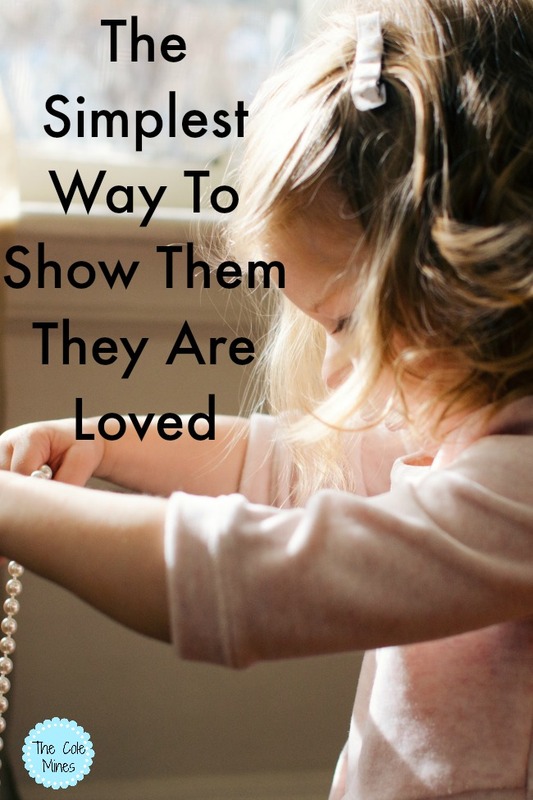 THE EASIEST WAY TO SHOW CHILDREN THEY ARE LOVED? The most rudimentary way to show your child you love them? Take an interest in what they love. For my girls, it’s playing dress up and baby dolls. It’s coloring and doing sidewalk chalk. It’s running beside them as they ride their bikes. It’s listening to them at the end of their school day to hear all about the new things they learned. It’s watching with genuine interest as they make up the 431st dance routine to What Does The Fox Say on Pandora. Showing your child you love them means taking a break from all of your “busy” and letting your kids be the focus. All day every day? No! Come on that is not even possible nor would it be good for you or your kids! But taking 20 minutes every day to sit down and actually PLAY Barbies? Yeah, that’s a sure fire way to show your child you love them. And even better – these oh so simple acts endear our children to us in a way that simply telling them we love them cannot. We are SHOWING them we love them. And we are giving them a chance to talk to us…about anything. About the thing we initially started with (said baby dolls). Or maybe about the girl in Science class that is being a bully. Or the kid on the bus who keeps trying to get them to smoke. Or about the pressure they feel to look a certain way/be a certain weight. We are opening the door. We are taking the invitation to come into their world and in accepting, we are showing them their invitation is worth having. That an invite to this “party” is worth its weight in gold.